My second (and longest) field trip this year was the Central Florida Specialties trip, led by my friend Dave Goodwin. I’ve done this trip several times, though I skipped it last year. 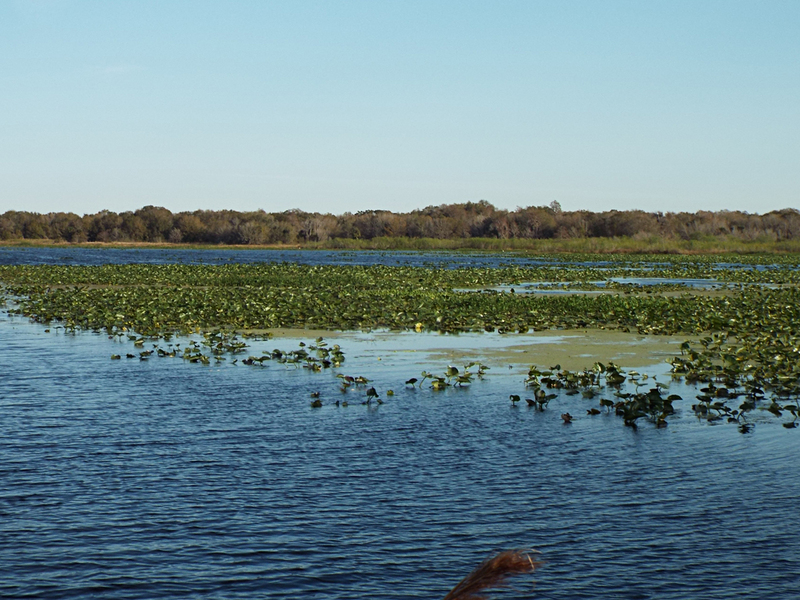 The trip includes stops in many different habitats in Osceola County. It was one of the coldest mornings of the season as we began, before dawn, to find Red-cockaded Woodpeckers at Three Lakes WMA [map]. 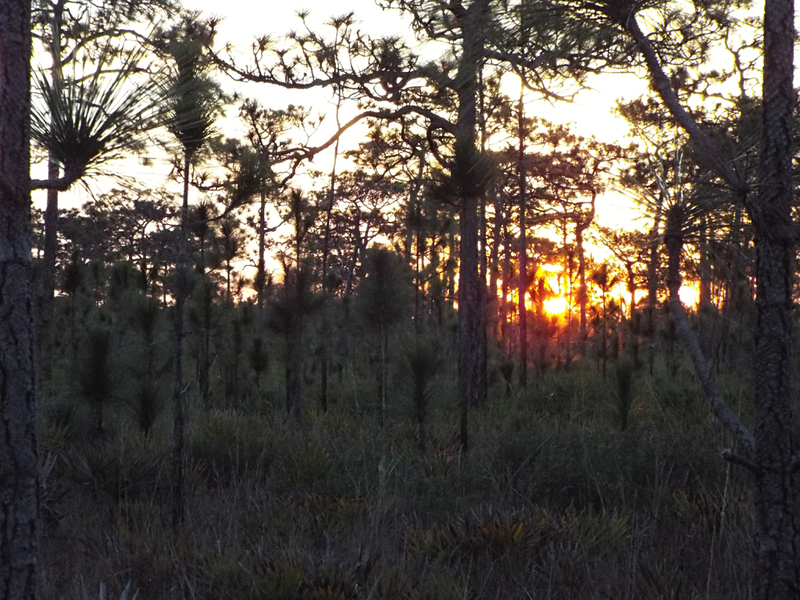 Sunrise over the pine flatwoods. 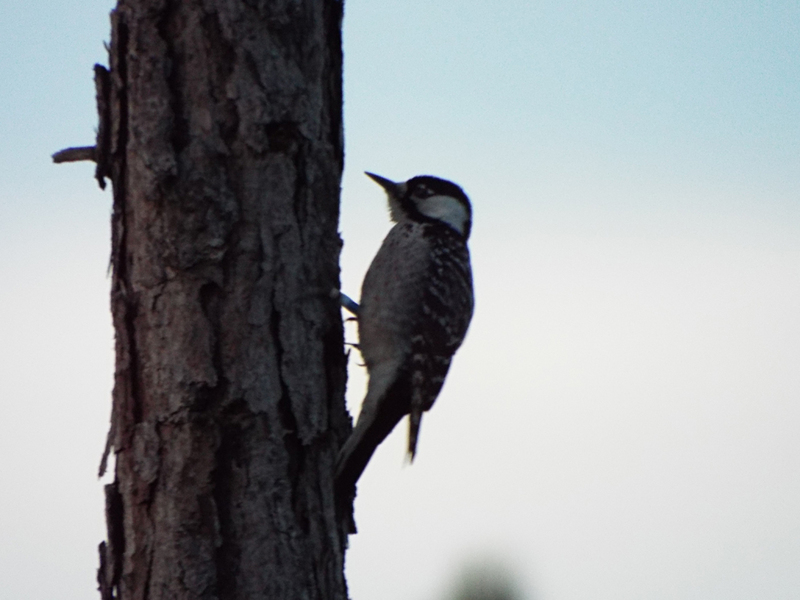 Although we arrived at our target area before sunrise, the woodpeckers were already active, flying low among the trees making their squeak-toy calls to one another. Red-cockaded Woodpeckers are cooperative, family nesters. Previous years’ offspring help parents raise the current brood in a territory, helping with things like feeding and defense. The white cheek-patch on this species is a “diagnostic” field-mark. No other small woodpecker in North America has this feature. The tiny red “cockade” feathers on the side of the head are nearly impossible to see in the field. As the sun came up, it got easier to see the birds, and they were fairly unconcerned with our proximity. 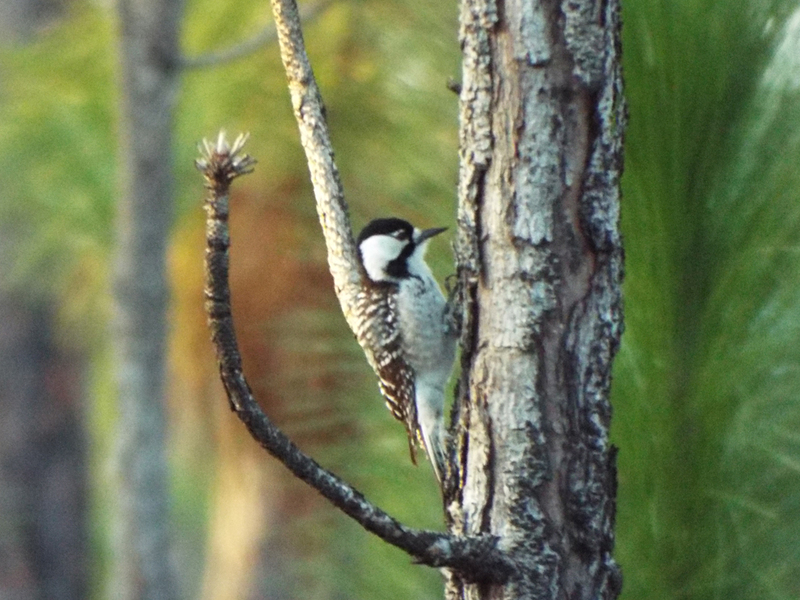 As the sun climbed higher and the temperature (slowly) with it, other birds of the pine flatwoods began to stir. We got a few Brown-headed Nuthatches, Eastern Bluebirds, and perhaps an Eastern Towhee call or two. Our other target species for the day in the flatwoods was the Bachman’s Sparrow. Late January is still a little early for this species to begin singing for mates and territory, but we tried calling them out a few times, with no success. I did hear one very distant song as we were beginning to move out and back to our group’s bus, but that was all. Our next stop was at Lake Jackson [map]. We did not stay long. The wind was blowing from the north across the lake, creating a natural air conditioner. It was cold enough to start with, and that just made it almost impossible to stand and scope out the lake for birds. After just a few minutes, Dave got us back in the bus for the next stop, out of the wind! At the marina [map] there were hundreds of Tree Swallows swarming around, providing a backdrop for some of the more dramatic species, like Limpkins, American White Pelicans, Bald Eagles, and even a pair of Bonaparte’s Gulls. Limpkins were relatively abundant, not just at this stop, but throughout the festival. 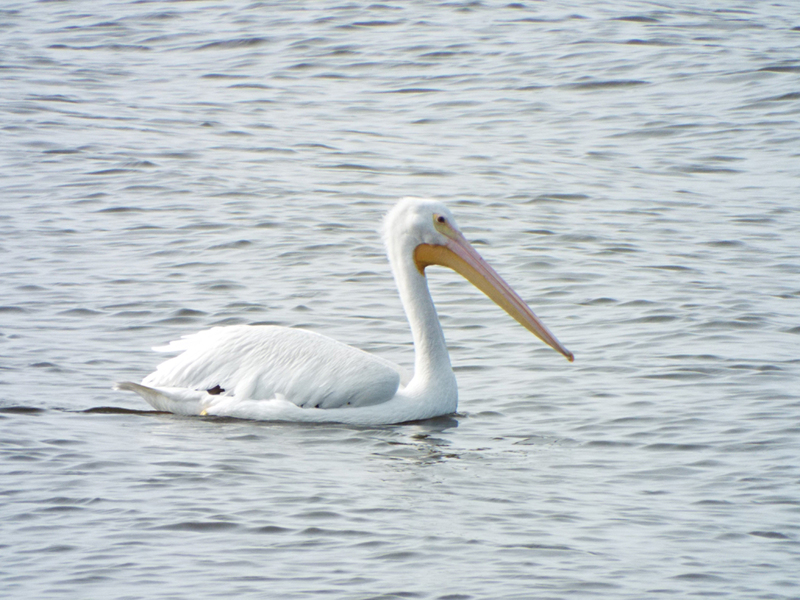 The proportions of the American White Pelican, when swimming or on the ground, can seen quite awkward. 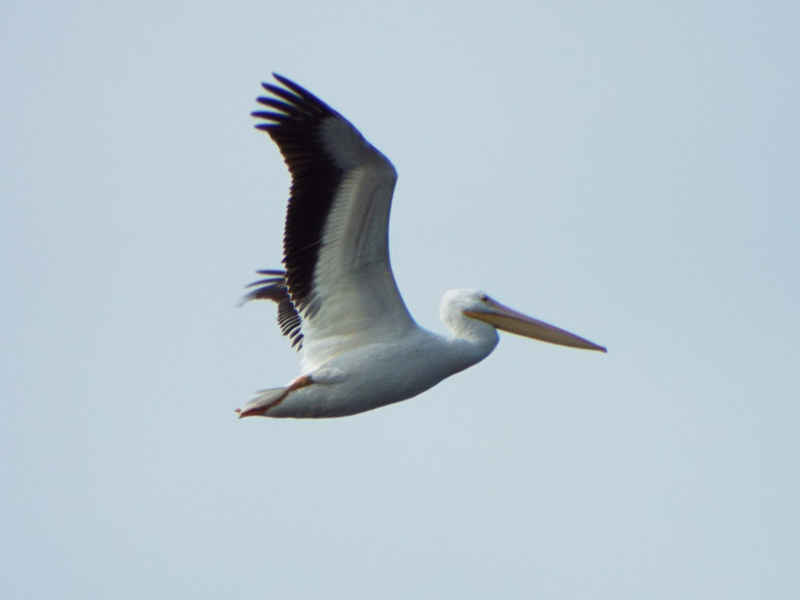 Once airborne, pelicans are surprisingly graceful birds. At the boat ramp [map] on the lake, we had a pair of Baltimore Orioles feeding among Yellow-rumped Warblers and American Robins. The vegetation that provided both food and concealment for these smaller birds was also the day roost for at least one Black-crowned Night Heron. 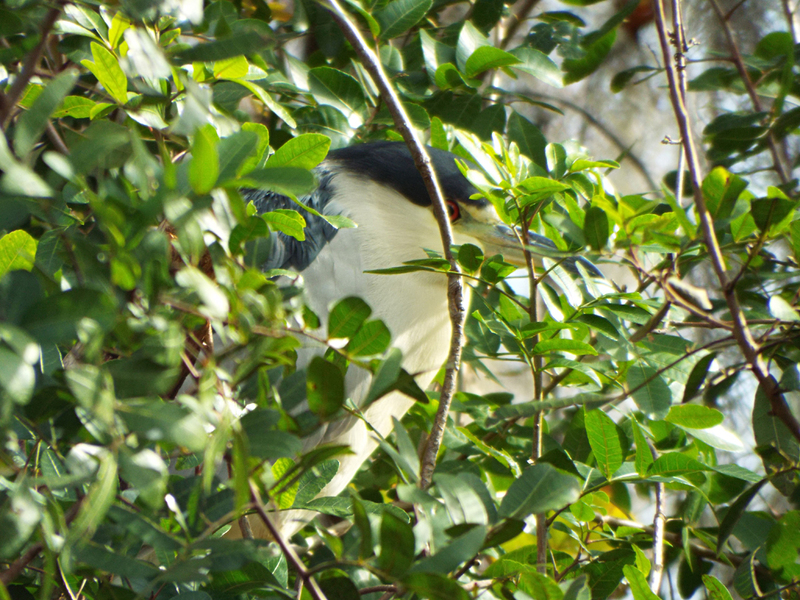 A Black-crowned Night Heron hiding out. After wrapping up at Lake Marian, we headed down Joe Overstreet Road to the Landing, on the shore of Lake Kissimmee [map]. As you head along the road, toward the lake, the habitat changes from upland and ranch agriculture to wetlands and lacustrine (that means “lake related”) landscapes. 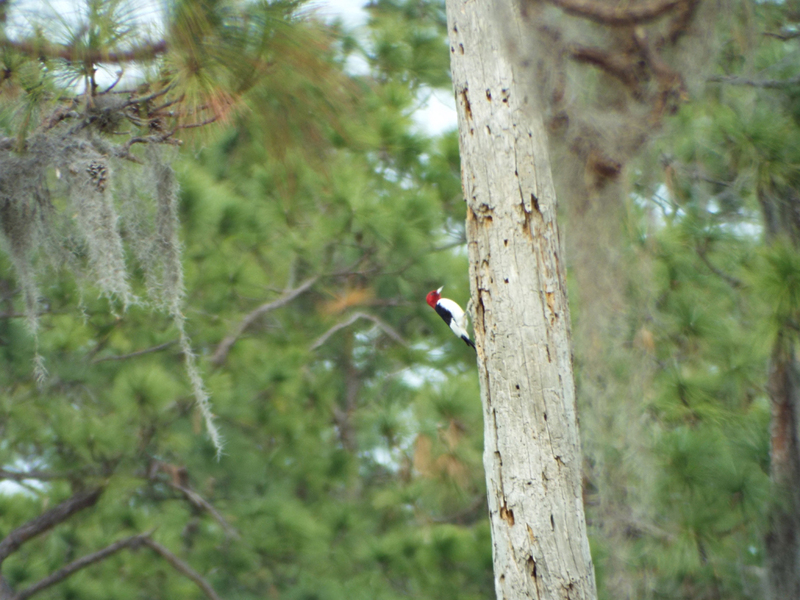 Adult Red-headed Woodpeckers really stand out, even from a distance! There is usually a family of Red-headed Woodpeckers near the start of the road, associated with some dead trees and farm buildings. We did not see them at first, but at least one adult came out to investigate some woodpecker calls we played. Further along, we had a few raptors, including a Bald Eagle harassing an American Kestrel on some irrigation equipment. The lands on either side of the road are still owned by the Overstreet family and include cattle and sod farms. Down by the water, the wind wasn’t as bad as earlier at Lake Jackson, but it was still a bit breezy. 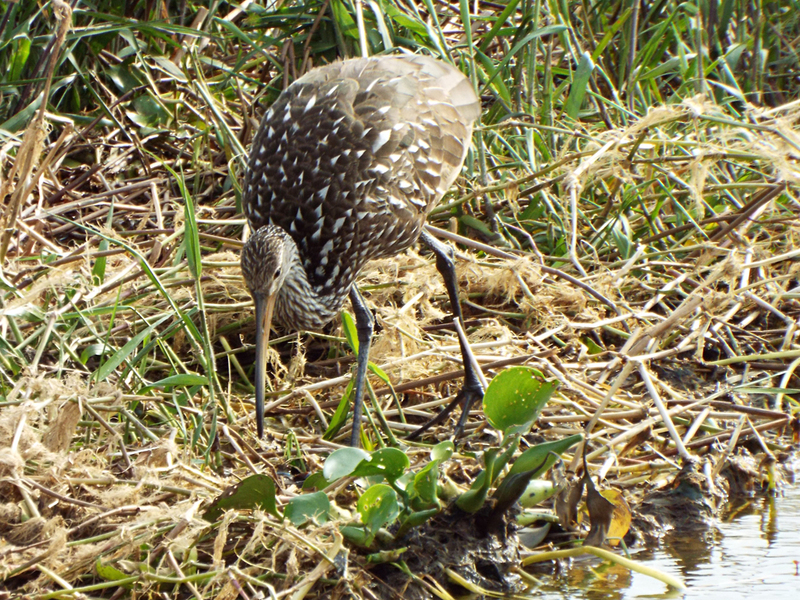 Some Wilson’s Snipes were slinking along nearby in the grass while Boat-tailed Grackles made a racket at the boat dock. 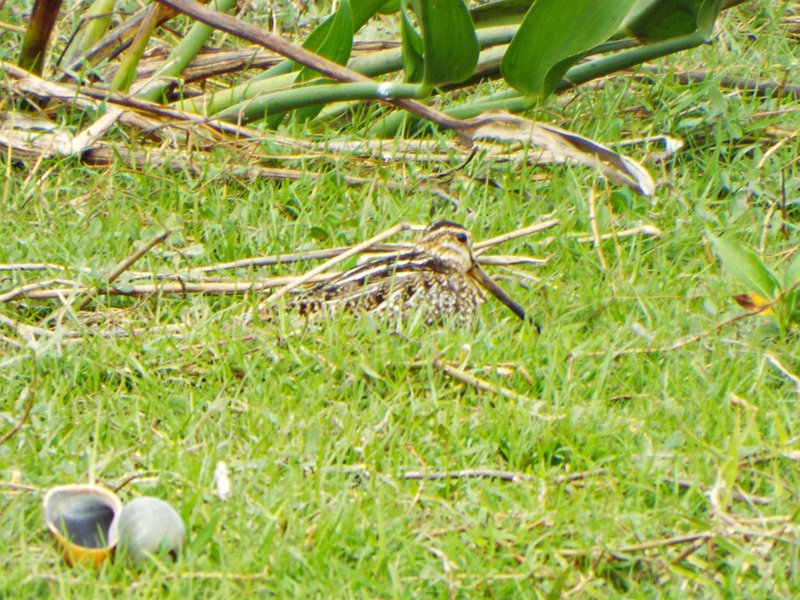 One of the nearby Wilson’s Snipes, probing the wet ground for insects. Note the large, invasive Apple Snail in the foreground. These are much larger than our native snails, but the Limpkins and Snail Kites seem to enjoy them. A single distant Snail Kite was seen in one of the spotting scopes, and one Bald Eagle, too. There were a few wading and diving birds out on the water, but nothing in very large numbers except for a flock of Cattle Egrets that made its way through. 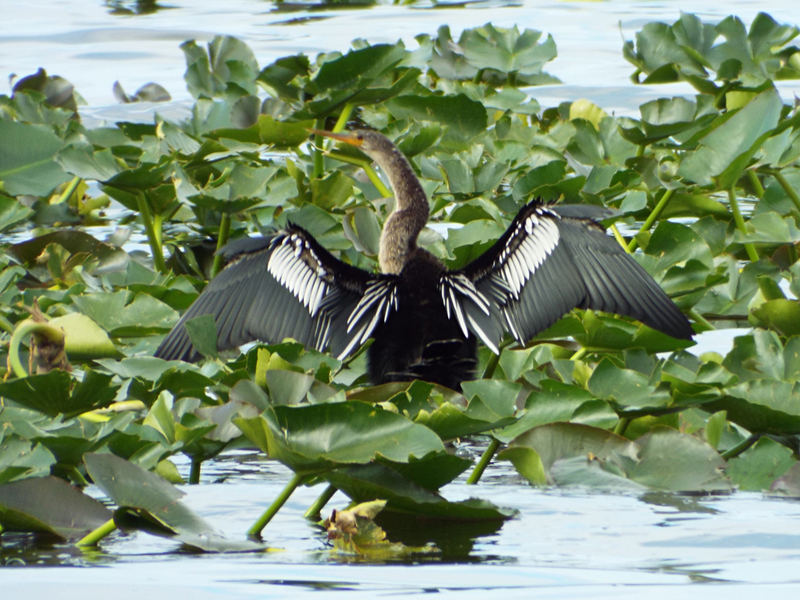 An Anhinga drying its wings among the lily pads. From Joe Overstreet we briefly stopped by the Double C Bar ranch [map], where the last known non-migratory Florida Whooping Crane sometimes hangs out. It was not seen, and Dave Goodwin talked a bit about how the non-migratory flock was a failed experiment, with most of the birds succumbing to bobcats and other predators. The focus now is on the migratory flock that winters in the panhandle and flies to Wisconsin in the spring. 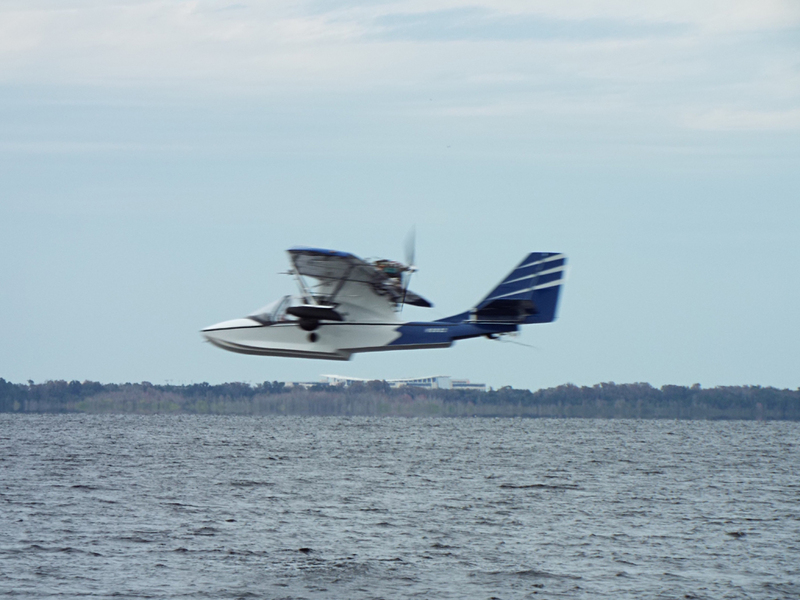 Our last stop of the day, at Lakefront Park on East Lake Tohopekaliga [map]. This place is known to have Snail Kites that pass close to the park and restaurant, and we hoped to get some good views. Unfortunately the weather got windier and colder, and a few of us got only one extremely distant view of a Snail Kite in one scope. 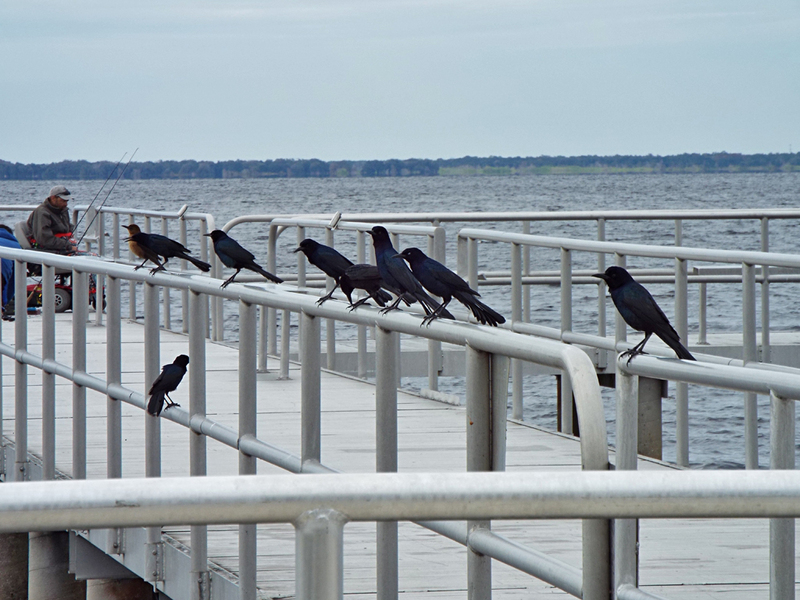 Boat-tailed Grackles defying the wind. That was about it for the trip. We headed back to Festival HQ after a long but fun day around central Florida. We didn’t get all our “hoped for” birds, but honestly, that’s only a small disappointment for me. We have to remember the birds are not there for us; we have the privilege to go and seek them out, but it has to be on their terms as much as possible. Conservation and education should take precedence over consumption and exploitation. Posted on 2017 February 10 2017 February 10 by Lonely BirderPosted in SCBWFTagged Birding, birds, birdwatching, central Florida, Osceola County, SCBWF, Space Coast Birding and Wildlife Festival. Next Next post: SCBWF 2017 Day 3: Wet Orlando Wetlands Park and More!